Consumer stocks offer a lot of potential but are getting increasingly risky. 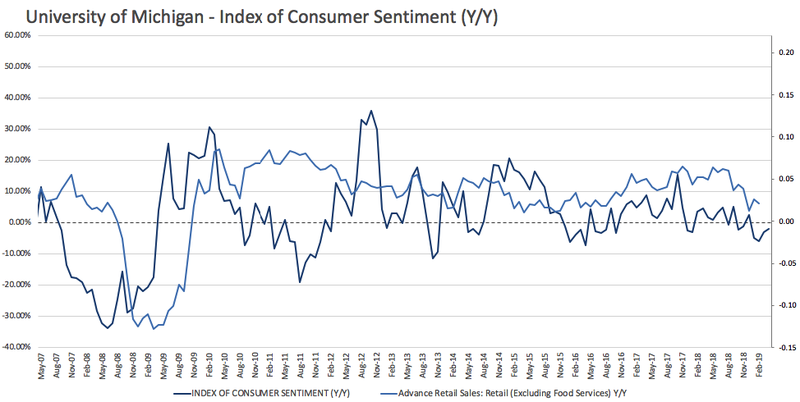 Slowing consumer sentiment is a fact which makes the current retail recovery even harder. The XLY ETF provides investors with higher returns than the 'average' retail stock and even with alpha compared to the S&P 500 during upswings. The US consumer, one of the greatest economic forces in the world as I will show you, offers a lot of investment ideas. Unfortunately, retail and consumer stocks are hard to pick given the current consumer slowing trend and pressure on margins from traditional brick-and-mortar stores. That's why the Consumer Discretionary Select Sector SPDR Fund (XLY) is the place to be. I will show you why this ETF is a better investment than single stocks that are prone to much more risk. So bear with me. In the intro of this article, I mentioned that the US consumer is one of the largest economic forces in the world. The graph below shows you why. According to this data, the US consumer was responsible for 17% of global GDP which is 1 point higher than the Chinese GDP and 11 points higher than the Japanese GDP. It is more than triple the GDP of Germany. If this isn't a market with investment chances, I don't know what is. Unfortunately, it's not that easy. The 'consumer trade' (if there even is such a thing) has been under a lot of fire lately. A lot of retailers across the board are seeing severe margin declines. I don't know how many retailers I have covered over the past quarters searched for ways to escape the rising trend of outperforming costs in an environment that increasingly favors retailers with a strong direct-to-customer channel. 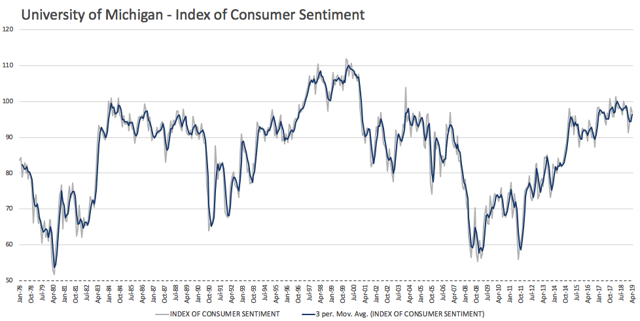 In addition to that, and this is where it gets interesting, we see that consumer sentiment continues to roll over. Preliminary April numbers from the University of Michigan show that consumer confidence is at 96.9, which is below expectations of 98.0. This miss is not what is key. What matters is that sentiment is clearly rolling over, with sentiment being down almost 2% in April. 7 of the past 10 months saw negative sentiment growth. The graph below shows this even better. Below, you are looking at year-on-year sentiment and retail sales growth. 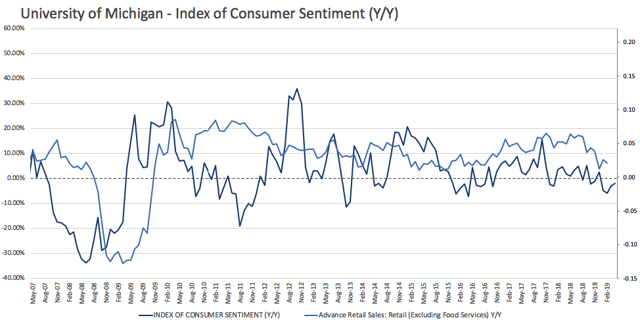 I wanted to show retail sales as well to display the effect falling (and rising) sentiment has on actual consumer spending. What we see is that it is quite clear that the downside risks are rapidly rising. At this point, retail sales are still at 2% growth. But it seems that it is just a matter of time until this weakens even further. Almost needless to say, retail stocks are not going to like this. The SPDR S&P Retail ETF (XRT) is at 2014 levels after going absolutely nowhere over the past few years. Only mid-term traders might have been able to profit from some selling and buying trends like the ones we saw in 2015 or 2018. 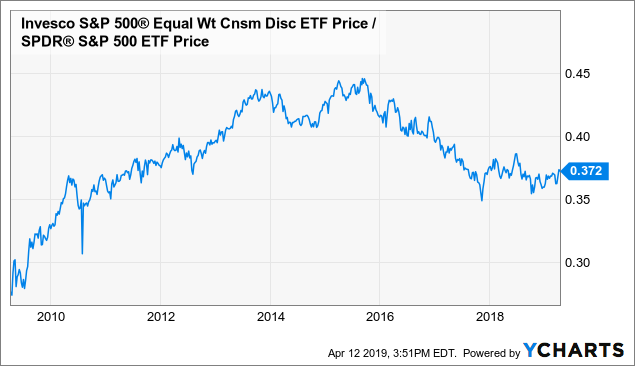 The equal weight ETF Invesco S&P Equal Weight Consumer Discretionary ETF (RCD) is doing much better. This ETF holds 65 consumer stocks. 50% large-cap stocks and 50% mid-cap stocks. The average consumer stock is very close to a new all-time high after slowly increasing from the sideways trend between 2015 and the end of 2017. The first thing that becomes obvious is that you don't want to own only retail. You want more exposure in the consumer space. And that's what we see when looking at RCD. However, the relative performance of RCD compared to the S&P 500 is in a downtrend since 2015 as you can see below. This does make sense because 2015 was the year when the strong post-2012 consumer recovery started to show signs of weakness while retailers began to see pressure on margins. This is where the Consumer Discretionary Select Sector SPDR Fund comes into play. This ETF is what you want to own if you like consumer stocks. Why? Because this ETF is not offering you equal exposure. XLY also holds 65 stocks. The difference is that the top 10 stocks have a total exposure of 65% compared to 17% for RCD. Just take a look at the top 5. Amazon (AMZN) alone has almost one quarter of the ETF's exposure with Home Depot (HD) coming in second. As you can see, the company directs a lot of exposure to industry leaders with a lot of potential despite having a large market share. This means you still own a lot of consumer stocks while you are mainly dependent on the strongest players. The XLY ETF also has 80% of its exposure in large-cap companies which does confirm the thesis that bigger players are favored. The ratio between XLY and RCD perfectly displays this outperformance as you can see below. Not only is XLY 'crushing' the equal weight ETF, the ETF is also outperforming the S&P 500 without any major interruptions. In other words, you not only have a better consumer exposure, you are also outperforming the S&P 500. On a side note, the XLY ETF has an expense ratio of 0.13% compared to 0.09% for the S&P 500 ETF (SPY). Consumer stocks are an interesting but difficult investment topic. The market is huge and there are almost endless ways to invest money. The problem we are currently seeing is that retail companies are struggling with stocks showing a severe underperformance. The average consumer stock is doing a bit better being very close to a new all-time high. 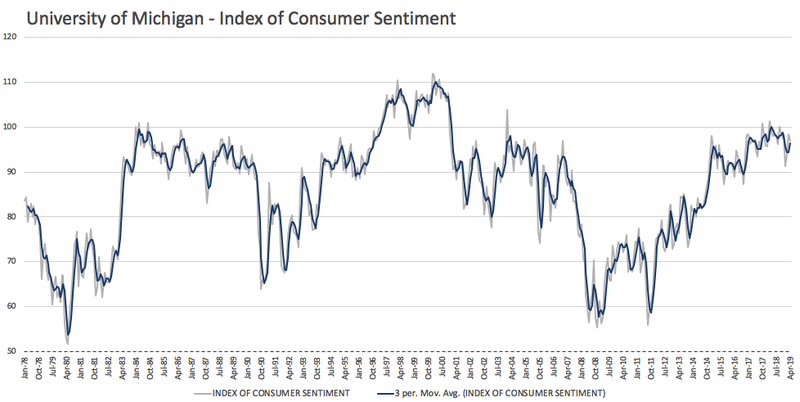 Additionally, we are seeing that consumer sentiment is continuing to weaken according to the latest data. The pressure on retail sales is growing, which makes a sustainable retail rebound even more unlikely. With all of this in mind, I am convinced that the average trader who wants to have exposure in the consumer segment should be owning XLY. 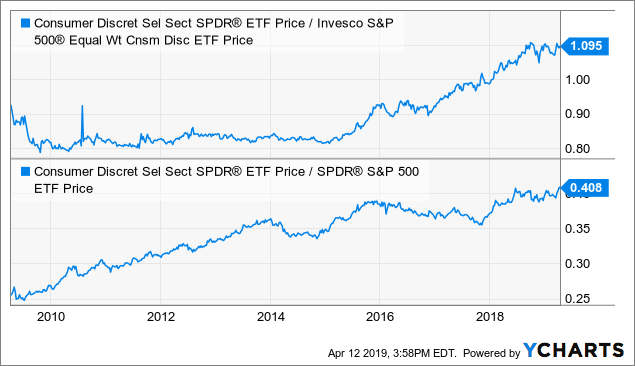 This ETF invests in the biggest and most successful players in every segment and offers you not only outperformance compared to the 'average' retail stock, this ETF also outperforms the S&P 500 during uptrends. Why go for a single retail stock if you can own an outperforming ETF with a low expense ratio? I think the only reason to choose a single stock over XLY is if you are willing to do extensive in-depth research or if you think you have a very good market timing that allows you to catch big moves from smaller players. If you just want to sit back and own exposure to the consumer business, I think you should not look any further than the XLY ETF. Thank you for reading my article. Please let me know what you think of my thesis. Your input is highly appreciated! Additional disclosure: This article serves the sole purpose of adding value to the research process. Always take care of your own risk management and asset allocation.